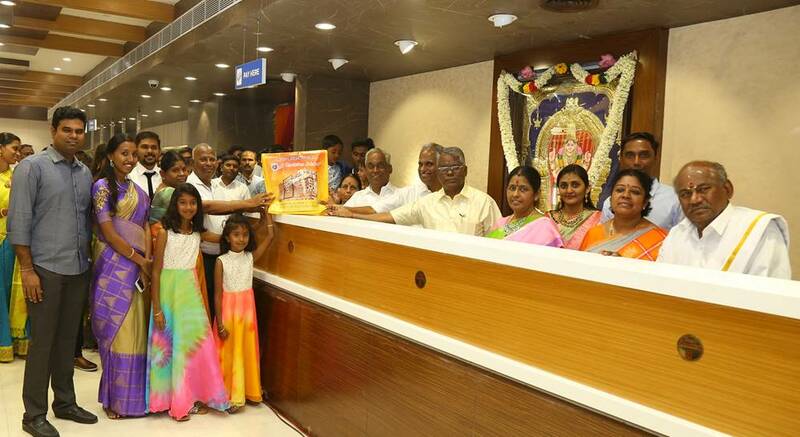 The 24th mega showroom of The Chennai Silks – South India’s most successful retail chain that has created waves with its high quality products, unique designs, competitive pricing and exceptional customer service was inaugurated in a grand manner today in Chrompet. This 8 storeyed building spread across 1,34,000 sq ft will also have “Sree Kumaran Thanga Maligai”, the finest jewellery showroom which is a part of the entire system. The novel feature of this mega showroom complex is that each 9 floor is earmarked for an important category like Sarees which includes Wedding, special occasion and regular wear; Ladies, men’s and kid’s wear and Gold, Silver & Diamond Jewellery available under one roof, thus making The Chennai Silks showroom at Chrompet, a one stop shop for the entire family. Mr. T.K. Chandiran, Managing Director, Mr. K Manickam, Mr. k . Sivalingam, Mr. P.K. Aroomugam, Mr. K . Vinayagam, Mr. K. Nandagopal & Mr. K. Paramasivam, Managing Directors and Mr. PM Shabari Egambaram, CEO were present and welcomed the guests. From a modest Khadi store to the largest textile kingdom in Tamilnadu, the progress has been electrifying. Apart from being a successful conglomerate, they have evolved as a socially responsible corporate citizen by installing 56 windmills to harness green power that meets a major percentage of the electricity needed. They are also producing 8MW of Solar Power. The Group runs a CBSE school and a hospital in Tirupur, as a part of their CSR. The Group has been recognized by the Guinness and Limca Book of records for producing a Silk saree that features reproductions of 11 paintings by the celebrated Painter Raja Ravi Varma.